A couple of tutorials ago I showed you how to Make a Featured Content Slider using the Coda Slider. It is cross browser and very easy to edit. Since then I’ve received many emails asking me how to edit it. 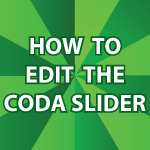 So, in this video I’ll show you how to edit the Coda slider. I also show you how to check if your website will look nice in other browsers. The tool I use is the Adobe Browser Lab. It’s free! If you want the code from this tutorial, it is available in this zipped archive. I’m running into a problem while editing the coda slider. I expanded the width to 840 pixels and everything was fine until a added a seventh panel. At this point all of the panels except number six lost their thumbnails. When I delete panel seven the problem disappears. Is there a limit to the number of panels one can use? I know this seems illogical, but I’m at a loss. Any suggestions? I added an eighth panel and the thumbs moved to the seventh panel. All other panels don’t display the thumbs. I’m still perplexed. I was missing some divs. It’s now working. The link at the top of this page points to how to make that.